The two main dock species broad-leaved dock (Rumex obtusifolius) and curly dock (Rumex crispus L.) are a problem for many organic farms in most areas. Although docks are not specifically an ‘organic’ problem, management on organic farms without recourse to herbicides can be particularly challenging. To date, there is no ‘magic bullet’ for the solution of the dock problem on organic farms. The most promising approach therefore is a combination of several measures. 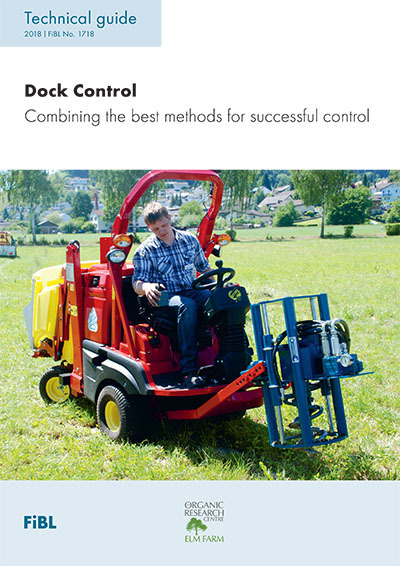 The strategy presented in this technical guide builds on measures to prevent the (further ) establishment of dock plants. Depending on the level of dock infestation, different techniques are recommended for removing and suppressing established docks. Only by dealing with the causes of dock proliferation can the reproductive cycle be broken and long-term control be achieved. This booklet results from the Organic Knowledge Network Arable project funded by the Horizon 2020 programme of the European Union. The booklet was produced by FiBL and the English version was adapted by ORC. Hard copies are available from ORC for £6.00 (incl. postage).